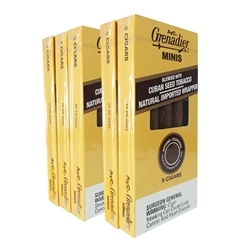 Antonio y Cleopatra Mini Cigars have a long history of satisfying American smokers ever since they were established in 1879. AYC Minis are refreshingly smooth and mild tasting cigars which are sure to get one hooked. With a long history of satiating American smokers, these smokes leave you with a lingering, mellow aftertaste. Try AYC cigars today at Smokers Discounts!